This is a great little sumpin sumpin to have at just about any special winter dinner or holiday. This can be made with just about any dried fruit or mixture or the flavor profile may be carefully orchestrated to just a few complementary fruits. The cost to make this is dependent on what type of fruit is used and how pricey the wine is. If you’re not wild about the wine, this is good with apple cider as the liquid. Since dried fruit is always on sale at a low during the winter holiday season, I take the opportunity to replenish my supply. 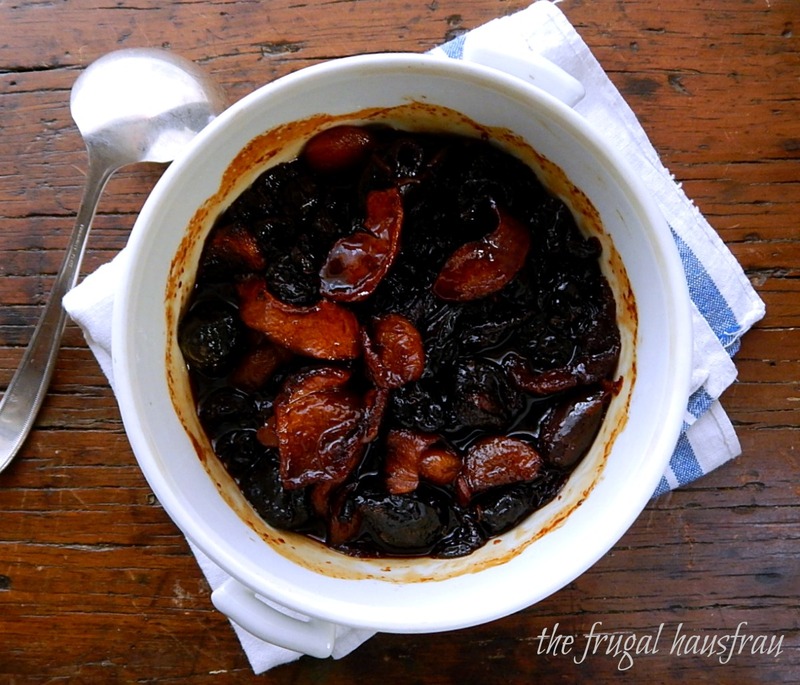 I’ll make this compote, then, from any fruit I still have in the pantry from the previous year. Even if any of the fruit seems a litter drier than it should be, the wine/sugar maceration plumps them up beautifully. Mix wine and sugar in a bowl until sugar is dissolved. Add the rest of the ingredients and chill overnight. Bake at 375 degrees for an hour, basting now and then until fruit is plumped and softened and wine is reduced to a syrup. (Keep in mind the syrup will thicken more if it’s chilled.) Watch carefully in the last 15 minutes. Serve warm or chilled on a Holiday buffet table. Leftovers make an interesting addition to vanilla ice-cream. Use a coupon matching site! Dried Fruit: is not always the cheapest thing to buy (if you make your own, it’s a different story) but the fall/winter holidays is a great time to buy with coupons and sales. Wine: I really shop the sales and speak to the employees – I find I can find great wines for a pittance. If you have a wine shop you like, I find you can get mailings or emails for their best sales – often in the fall and spring. You’d be surprised at the bargains you can get and how long you can use a bottle for quick little recipes. This entry was posted in Click here for Fabulous Food Posts and tagged Alcohol, compote, Dried Fruit, Frugal Hausfrau, Special Occasion, Wine. Bookmark the permalink. This is super delicious. It reminds me of my (Jamaican) Xmas fruit cake laced with assorted candied fruits soaked in rum/wines. Oh, it’s trouble…good trouble! I would love to try that fruit cake! I bet it is out of this world! Are you going to post it for us?!! Please?!! Yes,it’s calorie packed but good. I’ll post. Have to bake for my loved ones. I’ve to try yr spirited fruits soon. Adding vitamin-laden fruit directly to the booze would obviate any guilt I (might possibly feign to have) had. 🙂 Cheers right back at you! And remembering the truffles, I did not tell (child) number 2 about the alcohol in this so there would be some left for me! Your compote that is baked in the oven sounds delicious. It’s one of the highlights of the season, my Compost! Wow, this is fantastic! Love it! Love the drunken fruit, it would make a fantastic fruit cake also. The resulting spiced wine has to be so delicious. Thanks! And it really is a gorgeous dish – I might have to see if I can try to get another photograph because the ones I took just don’t do this justice. Drunken fruit is a fun name! I have an aversion to most fruitcakes although I’ve noticed in the past few years they’ve gone through a renaissance – but I think you’re absolutely right and these, chopped into bite sized pieces, would be fantastic in one.